A classic skateboarding game arrives on iPhone with mixed results. Just a little under a decade ago, we couldn't stop playing Tony Hawk's Pro Skater 2. No matter which platform (PlayStation, Nintendo 64, Dreamcast), we spent hours chaining together combos, running around the bull ring (while running over piles of poop) and fooling around Skater Heaven. This past week, we've done it again on the iPhone, with its own edition of Pro Skater 2. Sadly, this experience comes up short. Most of the goals remain intact. You'll go through each level, from a school to the skyward Chopper Drop stage, completing goals such as collecting letters (which spell SKATE) and reaching a certain number of points (including a basic and advanced goal). As you progress, you'll use your cash to unlock new levels, as well as improve your performance with better gear and fancier tricks. The better skateboarder you become, the more you acquire. 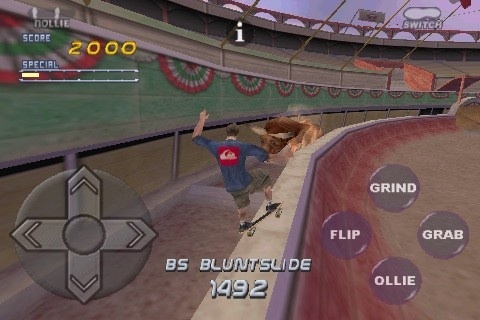 While it's fun putting together tricks with the iPhone version of Pro Skater 2, the controls are almost its worst enemy. There are two different schemes to choose from, manual and motion-sensitive. Manual lets you control your boarder with an on-screen D-pad, while tilting the device lets you steer them where you want to go. No matter which one you choose, you'll discover that not all your million-point linking combos work as well as they did in the other versions. Maybe it's how the game performs or how Activision tweaked it to run on the device, but something's different. That's not to say it's bad, as you can still pull off tricks and meet your goals with enough run-throughs. You just won't turn pro as quickly. Changes have also been made to the presentation. The levels look great with a few high-definition tweaks, and your selected boarder resembles the real thing, right down to the ridiculous grabs and bucking his feet on the ground to gain speed. However, there are times when the frame rate can't keep up, particularly on older iPhones. As a result, you may inadvertently crash, costing yourself several points and possibly even failing to meet a goal. As for music, most of the tracks from the original were replaced with new stuff. There's no more Anthrax or Rage Against the Machine, just some no-name bands. Between Career Mode, Free Skate and Solo Sessions, Pro Skater 2 has a lot to do. However, finishing goals and collecting items is about the extent of what's provided. There is no multiplayer, so you can't engage in a friendly match of "do the same tricks I do" and what not. Furthermore, you can't create your own skateboarder, and several of the past celebrity faces in the game, notably Marvel heroes like Spider-Man and Wolverine, are absent. Tony Hawk's Pro Skater 2 is a hard sell at $9.99, due to its quirky controls and lack of new content. On the other hand, if you love the original or need a quick skateboarding fix, you could do worse than ollie up the cash for it. What's Hot: Lots to purchase and unlock (once you get used to the controls), graphics look great for a decade-old game, plenty of skateboarding ground to cover (including the infamous Skater Heaven). What's Not: Imprecise controls, occasional frame rate issues, no sign of Spider-Man or Wolverine as unlockable characters, no multiplayer.